but I think it's an Easter egg bush. I found it while photographing azaleas this past weekend, which I just cannot do. I try - I really do - but they just look like azaleas, and for some reason, through the camera is just not the same as being in their midst, blossoms surrounding you, and I just can't get there. The images just look oh-so-boring. But the bush pictured above made me so happy, just teeming with these teeny candy eggs/grapes/berries dangling on those red, red limbs. I needed a little cheer - it's been one of those weeks for a couple of weeks now. I am still without a vehicle, listening to excuses from the dealership who will not replace a warranted part, still walking to work - okay until today, when storms are hovering overhead, and the only rental car I could find was a truck at 70 something dollars per day, and I had to call my mother and borrow her car. I am still without paper - I apologize to those of you who read my rant yesterday, but, truly, I was so frustrated; I removed the post later - it's not the kind of thing I want hanging around my blog - and the paper company will not even return a call or email; I have called & called & emailed & emailed, and despite the fact that they took my money 3 weeks ago, despite the fact that the order has never been shipped, despite the fact that they are usually a wonderful company, they just will not respond to me, and I am low on paper, working on this upcoming art show, and have gone from nice to not-so. And while I was typing that sentence, ABC's Good Morning America on in the background, their weather guy actually mentioned my town as a likely place for a tornado today - anywhere from here to Little Rock. I will not let this upset me, but we have to move my Jeep today, have to get it onto a car carrier using a "come-along" - I just love that term - but please, I am thinking, let it not be raining, let the wind be still. That's what I want in my Easter basket. A heart that stays calm. I think I would be calling the Better Business Bureau or someone. Who do you call about these internet companies anyway? I order so much stuff online. Cause I hate to go out into the traffic. You know the very traffic I speak of! I would be pissed off aplenty! Brenda - I filed a complaint this morning with the BBB in Michigan - that's where the paper company is. I hated to do it, but . . . And the thing is, I just want this problem cleared up & I'd like to know what happened, because they sell stuff no one else does, and I'd do business with them again if I just knew what was going on - if I just knew this was an aberration. (Is that spelled correctly?) It really makes me so sad. This is a horrible situation, and I feel for you. Just wanting the paper is bad enough. Why not contact you back. 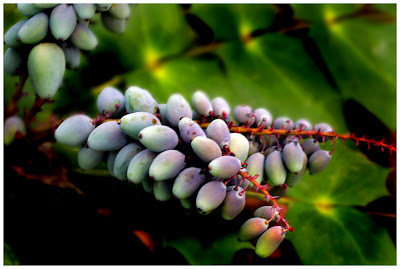 The beautiful bush, the Easter egg bush, is a Mahonia. It is a native here in BC, Canada. But there are many gorgeous varieties to plant. I really hope that you get what you want in your Easter Basket. And I am keeping my fingers crossed that you get your paper soon. So glad that I picked up that issue of Sommerset Life, and found your wonderful blog in it. It is a small world, I know Brenda's blog, she commented above. Muddy Boot - :) Thank you! I'm also glad you picked up that issue of Somerset Life. And it is a small world. Brenda & I live in the same town, but I found her in Paris, at Paris Parfait's blog. Debi, sorry to hear of your paper woes. I was going to tell you the name of this shrub but somehow I liked the the idea of it being an easter egg tree! :-) glad the paper trouble is sorted now.